1. Now that wedding seasoned has come to a lull, we had a free weekend! I took full advantage of it. 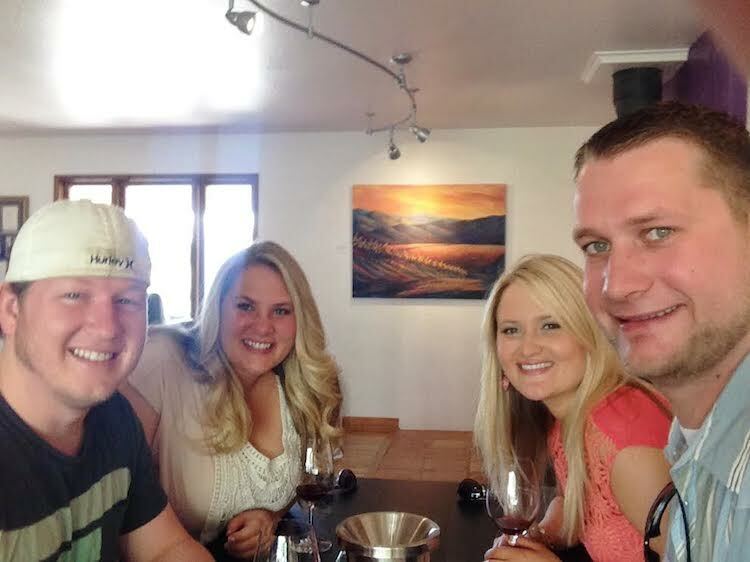 On Saturday, we went wine tasting in Livermore with my sister and her husband and had the best time! Even though it was over 90 degrees in October, say what? Luckily the tasting rooms had AC. On Sunday the 4 of us went out to lunch then saw Gone Girl. So good! They did a great job turning the book into a movie. 2. Speaking of wine tasting, my girlfriends and I group text each other quite often. Fun way to stay in touch since we’re all spread out over the Bay Area. My friend Courtney is in Hawaii, and sent us a picture of her “cheersing” us. 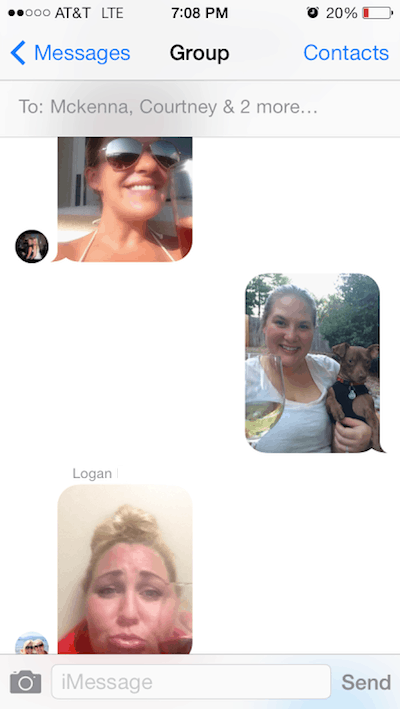 Within 1 minute, me and my friend Logan replied with a picture of us enjoying our glass of wine. Ha! I guess us gals like our glass of wine (or two?) at night around the same time. 3. A few days after our last wedding, the bride said said she had something for us. I picked it up this week, and it was a case (yes, 12 bottles!) of wine, a very nice hand written thank you card, and a generous cash tip. Isn’t that the sweetest?! I just love the brides I work with. 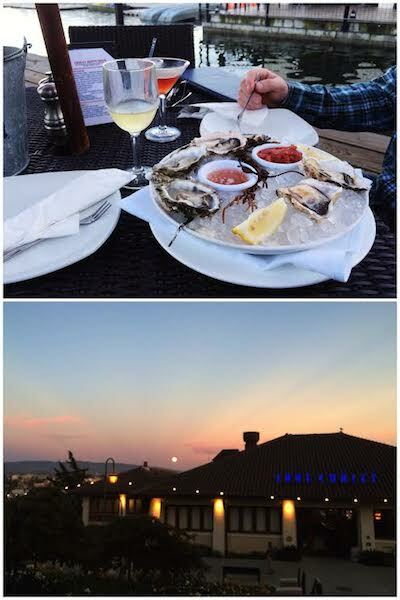 Shawn and I used the tip to treat ourselves to a fun weeknight date at Lake Chalet, this great restaurant in Oakland that’s right on the lake that has some amazing seafood. Of course we got oysters. 4. In case you haven’t noticed, our dog Max is always finding ways to get in trouble. This week, we were sitting on our chairs outside, and had to keep Max on a leash at all times or else he’ll just dart away. 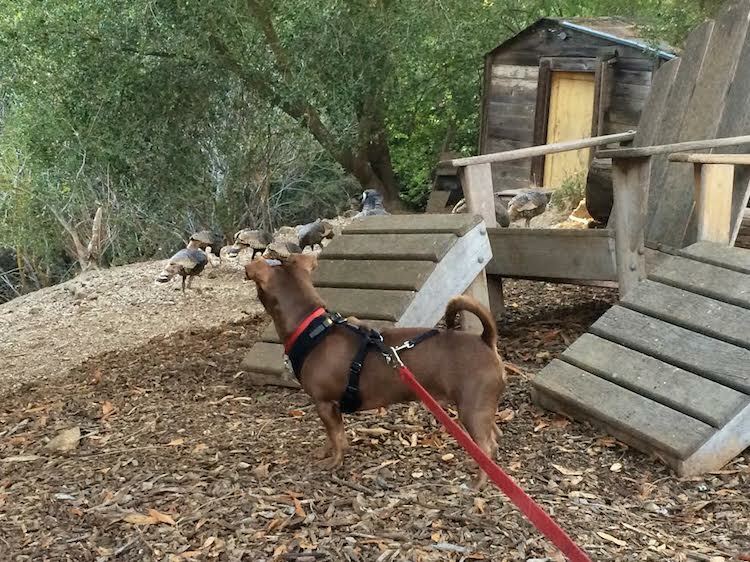 The turkeys were out, and he so badly wanted to go chase them. He kept chewing on his leash, and Shawn joked, “I bet he’s trying to chew his way out.” A few minutes later he starts casually walking away…with no leash! He had chewed right threw it! Don’t worry, we grabbed him in time. I had to run inside to get him a thicker leash that I was confident he couldn’t chew thru. It was a little longer too, so it gave him a good view of the turkeys. 5. I finished editing the photos from my first wedding I photographed! I am so happy with how they turned out. Since it was my first wedding, I was a tad bit nervous. But with a couple so beautiful and happy, it was a real breeze. You can see all my favorites from the day that I posted to our Facebook page. So far, everything we have posted for Acorn Films has been a short film Shawn has edited, or an engagement session Shawn and I both did together. This is the first photography session I have taken on completely solo for our little business. I showed Shawn the “top” pictures I posted on Facebook yesterday, and the proud look on his face made me so happy it made me teary eyed. And it has already gotten lots of likes and compliments on Facebook. It is probably the best feeling in the whole wide world, to feel that people think you did a good job. Like after posting my first recipe here, but somehow bigger because this is someones wedding day, rather than some salsa. I’m so happy I could burst! One of my very favorite pictures from the day is this candid shot of Callie I was lucky enough to capture right after she put on her dress. Every bride should feel like this on her wedding day! Wine tastings are so much fun! One of my absolute favorite things to do with a group of people. And I can’t wait to see Gone Girl! I haven’t read the book though, so I want to read that first. And how awesome that you got a case of wine from the wedding that you did! And congrats on editing your first wedding photos, they look absolutely gorgeous! Have a great weekend, Natalie! Looks like you have been having a great time! Those wedding photos are just stunning! Beautiful job! Beautiful photos!!! 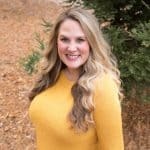 It’s so cool that you did your first solo shoot, the pictures are just fantastic! Sounds like you work with some really great brides, Natalie! How fun! 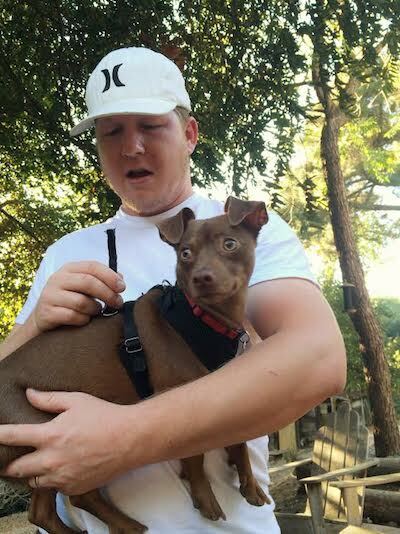 I can’t believe your dog chewed through that leash! He must have been on a mission haha. Have a great weekend! Those wedding photos are stunning!! You should totally be proud :) And I reeeeally want to see Gone Girl, it looks so good. Haven’t read the book though. Have a great week-end! Oh my gaah those wedding photos are GORGEOUS. You captured such a light and relaxed, yet glam and polished vibe. Stunning! I love looking through wedding albums haha Cheers to you and Shawn for making it through hectic wedding season (here’s me raising my glass of wine to you!) Enjoy your weekend, guys! Oh my gosh Nat, those wedding photos are stunning!!! You did an amazing job on your first solo shoot as the photographer :) Yay for wine tasting and the free case of wine :) Hope you guys have a great weekend! 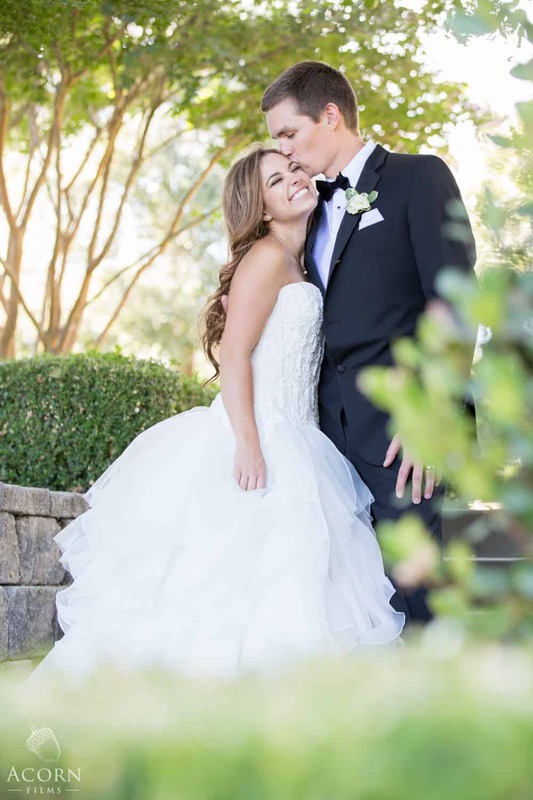 Awww, Natalie, you did such a great job photographing your first wedding! Congratulations, that is a very important job and you should be so proud of yourself! Glad you guys got out to celebrate. I wish I lived closer I would totally drink a glass of wine (or two) with you! I wish I lived in an area where I could go wine tasting!! It looks like you had a blast! How was “Gone Girl”? I keep hearing about it but haven’t seen it! Wow, those wedding photos! You are so good! Max cracks me up. Dogs are too funny (and rascals) some times! Oh my gosh, your wedding photos are SO beautiful! I love that candid… so perfect. My friends and I like to use the app GroupMe…. it has more of a chatroom feel than text and I just seem to like it better than group texts! Ha, my dog totally does the same thing. I’m always in shock when people have their dogs off-leash and they don’t run away! Can I just say that those are some absolutely stunning photos! The light is captured in such a gorgeous way. This doesn’t look like a “first” wedding at all! Total talent!!!! Wow! You are an amazingly talented wedding photographer. Those pictures are incredible! Nat, those wedding photos are beautiful! You did a really good job. You are right to be proud of yourself. You deserve everything that is happening to you ;-) And yes, we are going to the movies this weekend to watch Gone Girl. I can’t wait to watch it. I LOVE that candid photo of the bride!! Just perfect. You totally nailed it Natalie, great job! Also, turkey?? Did I miss something?? Awww, Natalie, you and hubby are photo geniuses!! I love the photos from the wedding you shot! You’re right, they’re a good-looking couple, but your photos are stunning. If I could turn the clock back to my wedding a couple of years ago, I’d be very happy to book you and hubs! Wow, the wedding photos are stunning! Congrats! What a great 5! Max just cracks me up. His cute little face has trouble written allllllll over it. I can’t get enough of your stories about him! What a stinker. And those wedding photos! You are SO talented, friend. I admire your work!